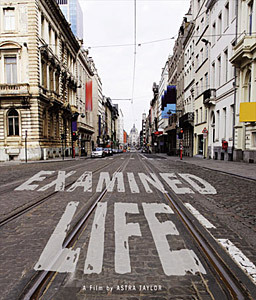 Examined Life (2008, Director: Astra Taylor): This documentary takes philosophy to the streets as filmmaker Astra Taylor conducts interviews with nine prominent thinkers in decidedly non-academic settings. Most entertaining is Cornel West, perhaps America’s best-known public intellectual, who rhapsodizes about jazz, blues and the life of the mind in the back of a New York City taxicab. Almost as interesting is Slovenian cultural critic Slavoj Zizek (the subject of Taylor’s first film, simply called Zizek!) who holds forth on the environmental crisis in the middle of a dump. His provocative suggestion is that humanity should become even more artificial and separate from the natural world. Martha Nussbaum provides a clear historical overview of political philosophy and discusses why the field is in dire need of new enquiry. The other segments were less successful for me, mostly because ideas were either insufficiently unpacked, or else huge assumptions were left undefended. Though that’s unavoidable in a film potpourri like this one, I think I would rather have had more time with the above three thinkers. As a film, it was only moderately successful. Though some of the subjects seemed happy to be in new settings, others seemed distracted by their surroundings or by their chosen method of locomotion (Michael Hardt struggling to steer his rowboat clear of obstacles rather took away from what he was actually saying). I’m glad that Taylor is making the effort to bring the work of these thinkers to a mass audience, but given the enormity of the issues they’re discussing, it seems a little unfair to limit them to ten minutes each. Since this was partially funded by TVO and the National Film Board, I’d be interested to know whether there were any talks about a series for television broadcast. I’d certainly tune that in. This entry was posted in Documentaries, Film Festivals, TIFF and tagged #tiff08, culture, disability, ethics, gender, philosophy, politics, theory. Bookmark the permalink.